OpenSSH is at the top of the pile of utilities you can use for encrypted data transfer. Here, we'll cover how to install the server side daemon. 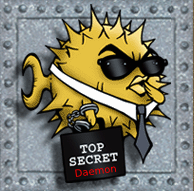 OpenSSH Daemon, or sshd is the server side of ssh secure communications. It listens out for incoming connections from ssh clients and spawns a process to handle them. You can install sshd either directly using apt-get, or via tasksel (a handy graphical software installation interface). Navigate the cursor to OpenSSH server, then hit the space key to select it. Now you'll be able to ssh to the box from another box.